Pettit Marine Paint reports The Port of San Diego successfully completed the panel testing phase of the Safer Alternatives to Copper Antifouling Paints Project. This extensive study’s first phase evaluated 46 coatings on fiberglass panels over a four month period. Of the 18 zinc-based, 4 organic-biocide and 24 non-biocide paints, Vivid Free from Pettit Marine Paint was selected as one of the top-performing anitfoulants, and now moves into the project’s second phase where it will be tested on a boat hull. 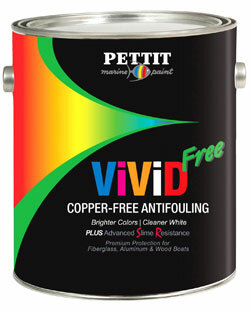 Employing the latest biocide technology and a unique controlled erosion process, EPA-approved Vivid Free is completely free of copper. Offered in 24 vibrant colors, it can be safely used on fiberglass, aluminum and wood hulls to protect against slime, algae, barnacles and other marine fouling. Boats using non-oxidizing Vivid Free can be hauled and re-launched without recoating. Effective in all water types.